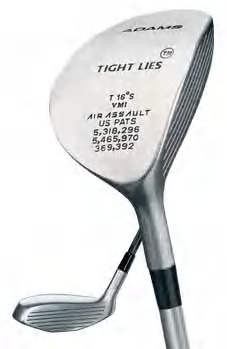 Adams Tight Lies 16* Air Assault fairway wood The "Original" Tight Lies patented "upside–down" design creates a lower center of gravity and a larger Effective Hitting Area (EHA) to make even the toughest approach shots easier to hit – off the fairway, rough, or sand. From every distance or any lie, Tight Lies helps you get the ball airborne effortlessly, letting you attack the green with more confidence than any other fairway wood. Visit our Ebay store to view all our custom built clubs. Visit Pargolf Custom Built Golf Clubs today!